How Do You Take a Monomial to a Power? Got a monomial raised to a power? 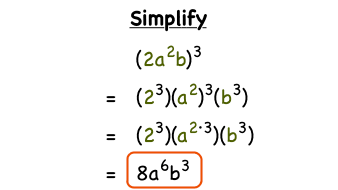 Want to simplify it? You could use the power of a product rule. You may also need the power of a power rule too. In this tutorial, you'll see how to simplify a monomial raise to a power. If you learn about algebra, then you'll see monomials everywhere! Watch this tutorial and learn what makes a monomial, and what does not. What's the Power of a Power Rule? Sometimes you'll see a number with an exponent raised to another exponent, and the first time you see it, you probably think it's a typo! But it's not a typo, it's a real thing, and there's a really nice trick for making it simpler that you'll see in the video. What's the Power of a Product Rule? There's a great trick for raising a product of two number to an exponent, and this tutorial shows you exactly that trick works. How Do You Solve a Word Problem by Taking a Monomial to a Power? This tutorial shows you how to find the volume of a cube box. The fun part? The measurement of each side is a monomial! Watch this tutorial to see how to cube a monomial.